Baked Multi Colour Highlighter: Here comes the summer glow! The baked multicolour highlighter comes in two versions with shades that conjure-up a fresh, shimmering complexion - either individually or in combination. Gently sweep a highlighter or fan brush over the highlighter and apply on the bridge of the nose, the cheekbones and under the brow arch (01 dreams are calling, 02 chasing the sun). Bronzing Water: Softly tanned skin instantly makes us look fresher and healthier - and it’s couldn’t be easier to achieve a dreamlike beach complexion this summer than with the new bronzing body mist: the tanning spray gives you a pleasant fresh feeling and it intensifies our tan with each application ‒ all without UV radiation (01 here comes the sun!). Bronzing Drops: For sun-worshiper skin. With its two nuances, the liquid bronzer in a trendy drop packaging provides metallic shimmering or sun-kissed accents. Apply one drop on the area that you wish to emphasize or spread several drops over the entire face and blend gently with your fingers for an ultimate glow (01 sunshine in my pocket, 02 golden sunset). Mat Bronzing Powder Waterproof: Let’s go to the beach! The waterproof bronzer conjures-up a natural tan on the face and neckline, and thanks to its jumbo size, it has a particularly high yield. There are two different shades for lighter and darker skin types. Now nothing can stand in the way of a relaxed beach day - no matter whether in the water or on the sunbed (01 summer lovin', 02 beach days)! Face Brush: Let’s go to the beach! The waterproof bronzer conjures-up a natural tan on the face and neckline, and thanks to its jumbo size, it has a particularly high yield. There are two different shades for lighter and darker skin types. Now nothing can stand in the way of a relaxed beach day - no matter whether in the water or on the sunbed (01 stay gold!)! I don't do previews very often any more but I loved this collection. I could easily get all the products but I will probably only choose a few. 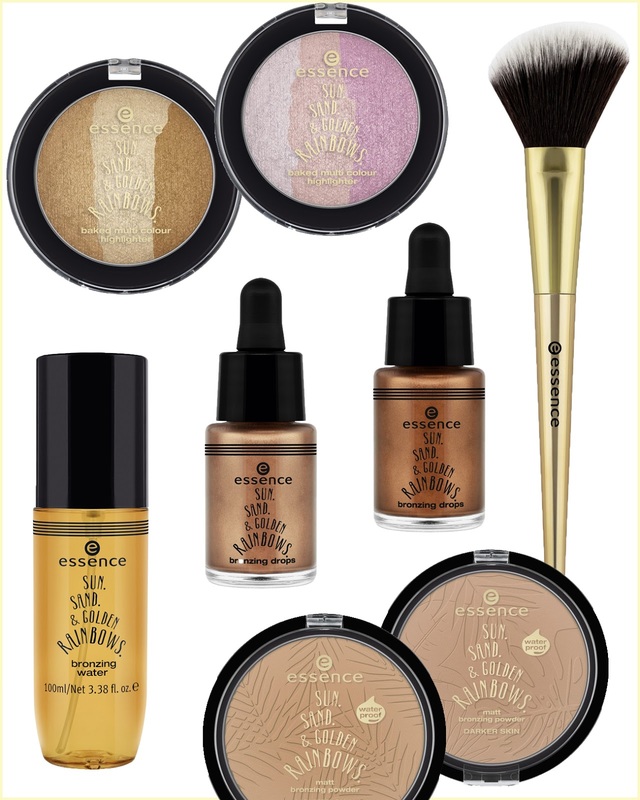 I will definitely get the golden highlighter because they are always the best, also, I love Essence bronzers so I will check them out too. What's on your WL? Thank you for reading! Kolekcija bo pri nas na voljo od 15.5 v drogerijah DM, Leclerk Maribor in Ljubljana, drogeriji Ilirija, Spar Citypark Ljubljana in na Licila.si.